My five year-old is a big fan of working in the kitchen. Below are some of his favorite, and my favorite, items for cooking and eating like a kid. If your kid likes cooking, I say get him or her a real rolling pin, not a toy rolling pin. These rolling pins are sized for kids’ hands, and they offer real rolling pin action for kids who want to cook for real, not just pretend. Kids are short. This sturdy step stool is easy to move around, takes a beating, and never wobbles when a kid is standing on it and jumping up and down because he is excited about baking cookies (warning: don’t let your kid jump up and down while he is standing on a stool, whether or not there are cookies in his or her future). Doubles as a nice step stool for short parents (ahem). I admit, this is a suggestion meant not just for children. Every adult should also have measuring spoons like this in his or her cooking arsenal. This CIA Masters measuring spoon set exemplifies everything that measuring spoons should be. They are sturdy, so they won’t bend if you are made to scrape something heavy or tough while measuring (hard brown sugar, lumpy baking powder—not ideal, but let’s not pretend it never happens). The spoons are deep, so they won’t spill their contents while your kid is haphazardly measuring stuff (shallow measuring spoons are notorious for this, and I loathe it so). Sure, these cost $21.50, but you’ll never buy measuring spoons again (which cannot be said for buying several sets of cheap measuring spoons—or, god forbid, plastic measuring spoons—and then replacing them every couple of years when they inevitably bend or break). If you are using a cast iron pan, the handle of that pan is going to get wicked hot. I know you’re keeping the handle of your pan away from your kid while he flips his pancakes on the stove, but, still, prepare for the inevitable and cover your pan handle with one of these anyway. It’s under $10. Do it and you’ll feel more relaxed, I swear. Scoops like these come in many portion sizes, and they are invaluable for kids who want to fill muffin tins, portion out cookies, or scoop out batter for their own pancakes and waffles. The handle is easy to squeeze, making release of whatever is in the scoop a cinch, and, if your kid is working near the stove or a hot waffle iron, the handle is long enough to keep his or her hand away from the burn zone. Oil cloth is a great material for a child’s apron, as it can be wiped clean in a single swipe, or run under the faucet and wiped clean in the case of a more substantial run in. 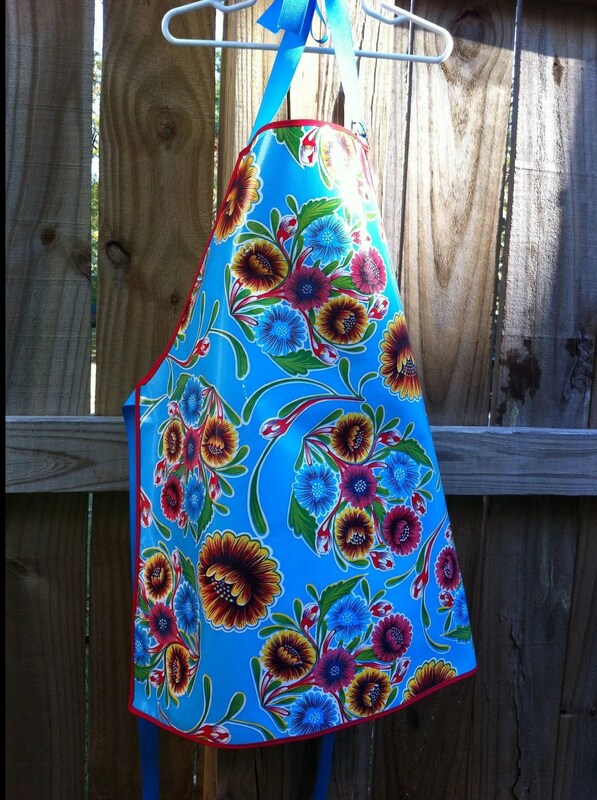 You can generally find oil cloth aprons on Etsy, in toy stores, or at well-stocked kitchen stores that cater to the needs of families (FYI, these shops are usually local, and not of the chain store variety). Not everybody knows how to wield a pair of chopsticks. Sure, they’re meant for kids, but who’s to say that you don’t know an adult or two who is secretly pining for a pair of these? Or maybe sea life is more your thing? These are all great gift ideas! I second all of them. In my, somewhat more limited experience cooking with kids, having just these few things around would make things run more easily and thus be even more fun! Thanks for the great suggestions.